Our project is how starch and protein are synthesized in rice plant. We construct and select mutated rice lines and analyze biochemical characterizations for modified rice quality. Furthermore, we have an interesting in the food processing of rice flour enable increasing consumption. Chou, H.L., Tian, L., Kumamaru, T., Hamada, S., and Okita, TW. : Multifunctional RNA binding protein OsTuder-SN in storage protein mRNA transport and localization. Plant Physiol. 175 (4), 1608-1623 (2017). *Hamada, S., Kubota. K., and Sagisaka, M.: Purification and characterization of a novel extracellular neutral metalloprotease from Cerrena albocinnamomea. J. Gen. Appl. Microbiol., 63, 51-57 (2017). 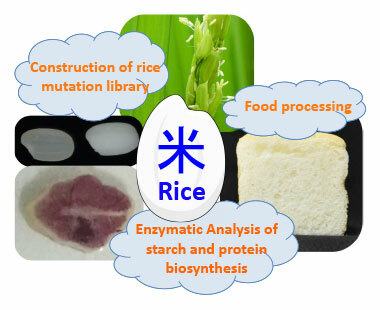 Araki, E., Ashida, K., Aoki, N., Takahashi, M., and Hamada, S.: Characteristics of rice flour suitable for the production of rice flour bread containing gluten and methods of reducing the cost of producing rice flour. Japan Agricultural Research Quarterly (JARQ), 50 (1), 23-31 (2016). *Hamada, S., Toda, K., Ogawa, S., Kubota, K., and Miyairi K.: Characterization of the effects of C-terminal pro-sequence on self-inactivation of Stereum purpureum endopolygalacturonase I. FEMS Microbiol. Lett. 362 (17), fnv134 (2015). Suzuki, Y., Miura, K., Shigemune, A., Sasahara, H., Ohta, H., Uehara, Y., Ishikawa, T., Hamada, S. and Shirasawa, K.: Marker-assisted breeding of a LOX-3-null rice line with improved storability and resistance to preharvest sprouting. Theor. Appl. Genet., 128 (7), 1421-1430 (2015). *Hamada, S., Suzuki, K., and Suzuki, Y.: Development of a new selection method and quality improvement of sugary-1 rice mutants. Breed. Sci., 63 (5), 461-467 (2014). Wakuta, S., Shibata, Y., Yoshizaki, Y., Saburi, W., Hamada, S., Ito, H., Hwang, S.K., Okita. TW., and Matsui, H.: Modulation of allosteric regulation by E38K and G101N mutations in the potato ADP-glucose pyrophosphorylase. Biosci. Biotechnol. Biochem., 77 (9), 1854-1859 (2013). *Hamada, S., Suzuki, K., Aoki, N., and Suzuki, Y.: Improvements in the qualities of gluten-free bread after using a protease obtained from Aspergillus oryzae. J. Cereal Sci., 57 (1), 91-97 (2013).